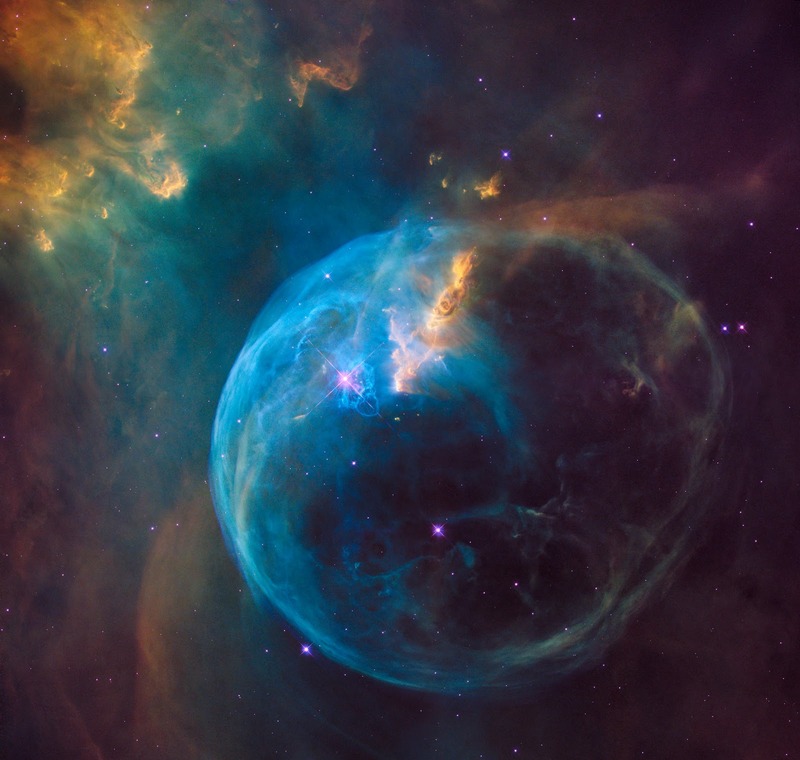 The Bubble Nebula, also known as NGC 7635, which lies 8 000 light-years away in the constellation Cassiopeia. This object was first discovered by William Herschel in 1787 and this is not the first time it has caught Hubble’s eye. However, due to its very large size on the sky, previous Hubble images have only shown small sections of the nebula, providing a much less spectacular overall effect. Now, a mosaic of four images from Hubble’s Wide Field Camera 3 (WFC3) allows us to see the whole object in one picture for the first time. This complete view of the Bubble Nebula allows us to fully appreciate the almost perfectly symmetrical shell which gives the nebula its name. This shell is the result of a powerful flow of gas — known as a stellar wind — from the bright star visible just to the left of centre in this image. The star, SAO 20575, is between ten and twenty times the mass of the Sun and the pressure created by its stellar wind forces the surrounding interstellar materialoutwards into this bubble-like form.